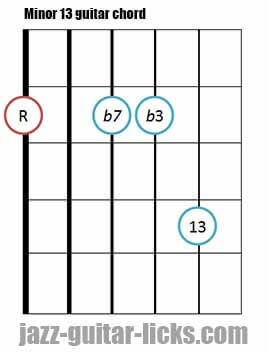 What are minor thirteenth chords ? 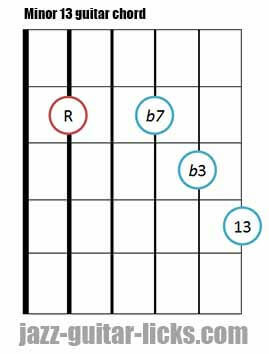 Minor thirteenth chords are made of seven tones, namely root (1), minor third (b3), fifth (5), minor seventh (b7), ninth (9), eleventh (11) and thirteenth (13). They can be used to replace or enrich any minor chord. Because of the number of notes it is physically impossible to play all of them on the guitar. That's why, as you will see in the chord shapes below, some tones have been omitted.